Invasive species are considered to be a leading cause of the decline of threatened species. However, this view has been disputed because much of the evidence base is anecdotal. This systematic review, through an extensive, repeatable search using agreed selection criteria, examined the available scientific evidence on invasive species’ interactions with the 1363 endangered and threatened species protected under the United States Endangered Species Act (ESA). The review found scientific evidence available for 116 endangered or threatened species (8.5% of the ESA list). Of these, 85 species (6.2%) were reported as being negatively impacted by invasive species: 39 located on the continental US and 39 on islands, with seven marine species. The relative percentages of species impacted differed according to location: 4.3% (n = 906) on the continental US, 9.3% (n = 420) on islands. It was found that predation by invasive vertebrates on birds on islands and competition between invasive plants and endangered or threatened plants on the mainland were the main mechanisms of impact. The results of this study contrast markedly with a previous study which found that 49% of imperilled species in the United States were threatened by invasive species. Further research is essential in order to evaluate the impact of invasive species on imperilled species on the ESA list; this would help to reduce the high degree of uncertainty regarding the threat of invasive species due to the lack of empirical information. This article belongs to the Topical Collection: Invasive species. The online version of this article (doi: https://doi.org/10.1007/s10531-018-1595-x) contains supplementary material, which is available to authorized users. Biological invasions are considered a major part of global change (e.g. Vitousek et al. 1997; NRC 2000; Sala et al. 2000; MEA 2005; Mooney et al. 2005; Richardson and Pyšek 2008; Davis 2009). Invasive species can significantly alter ecosystem processes and functions (Vitousek 1990; Mack et al. 2000; Pyšek and Richardson 2010; Vilà et al. 2011). This can result in major environmental damage and economic losses, amounting to $120 billion annually in the United States alone (Pimentel et al. 2005). They also cause declines in biodiversity (Powell et al. 2011) and affect disturbance regimes (Mack and D’Antonio 1998). Invasive species are responsible, alongside overexploitation, for half of species extinctions for which the cause is known (Clavero and García-Berthou 2005; Bellard et al. 2016a, but see also Gurevitch and Padilla 2004) and most of the extinctions are as a result of the introduction of vertebrate predators on islands (Courchamp et al. 2003; Bellard et al. 2016a, 2017). 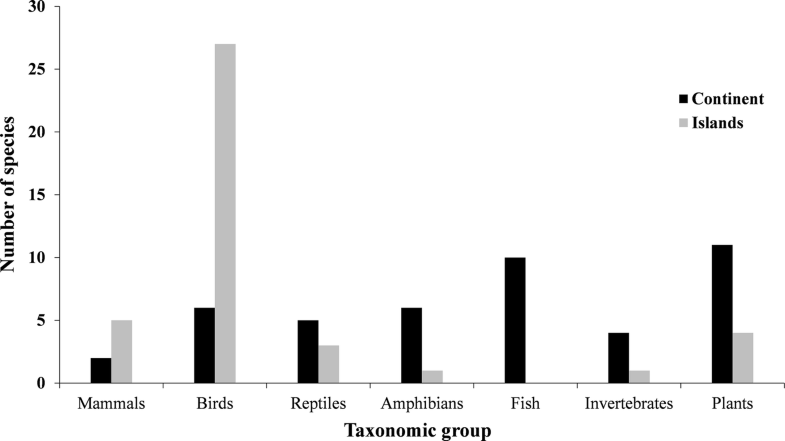 According to different studies ranking threats to biodiversity for various taxa, invasive species are the second biggest cause of endangerment after habitat loss (Wilson 1992; Baillie et al. 2004; Venter et al. 2006; Evans et al. 2011). Identical rankings have been identified for the United States despite the different taxa and data sources used (Flather et al. 1994; Schemske et al. 1994; Czech and Krausman 1997; Richter et al. 1997; Foin et al. 1998; Wilcove et al. 1998; Lawler et al. 2002; Wagner and Van Driesche 2010). Wilcove et al. (1998) in particular stated that invasive species had contributed directly to the decline of 49% of imperilled species in the United States. This paper has been highly cited (over 3000 citations according to Google Scholar); but it has been argued that some citations have been misleading about the geographical area covered by the study (as noted by Davis 2011; Chew 2015), and that there was some bias because of the inclusion of Hawaii, given its high number of endemic species (Gurevitch and Padilla 2004; Venter et al. 2006; Davis 2011). It has also been pointed out that this study was based on anecdotal data (Gurevitch and Padilla 2004; Chew 2015), as stated by Wilcove and colleagues themselves. Moreover, information about threats to endangered species is either absent or limited (Flather et al. 1994; Schemske et al. 1994; Tear et al. 1995; Easter-Pilcher 1996; Foin et al. 1998; Wilcove et al. 1998; Lawler et al. 2002) for the species listed in The United States Endangered Species Act (ESA) 1973, which provides a legal framework for the protection and recovery of species in order to reduce the risk of extinction (NRC 1995). Given this lack of knowledge about the impact of threats in general, and in particular those posed by invasive species to threatened species, a scientific, evidence-based approach is needed (Gurevitch and Padilla 2004). This approach can be achieved through systematic review, a methodology that involves the systematic searching of available literature and the synthesis of evidence to provide empirical answers to scientific research questions (Pullin et al. 2004; Sutherland et al. 2004; Pullin and Stewart 2006). Unlike conventional reviewing, it involves an explicit methodology, and through using clearly defined protocols it minimises bias and improves transparency, repeatability and reliability (Roberts et al. 2006). The principal aims of this work are to retrieve all of the available published scientific evidence on interactions between invasive species and endangered and threatened species (hereafter imperilled species) on the ESA list and to determine the main mechanisms of the interaction. This review focuses on the extent of the science-based evidence of the invasive species threat, rather than on the relative ranking of invasive species against other threats. This systematic review was carried out following the guidelines specific to conservation interventions developed for the Collaboration for Environmental Evidence (CEE) (Pullin and Stewart 2006; CEE 2013). The search strategy and inclusion criteria were included in a protocol published in advance in a peer-reviewed journal (Roberts et al. 2013). The search for peer-reviewed literature was conducted using the following electronic databases: ISI Web of Science, CAB Direct, Scopus, ScienceDirect, JSTOR and Agricola. The search set was undertaken in March 2012 and covered all of the literature indexed up that date. The following search string was used: (“invasive species” OR “invasive alien species” OR IAS OR feral OR “introduced species” OR “non-indigenous” OR alien OR “invasive plant” OR “invasive weed” OR exotic OR “non-native”) AND (scientific name of all imperilled species listed separated by the Boolean operator ‘OR’). Additional references were identified using Google Scholar and specialised invasive databases (see Roberts et al. 2013). The species included in the search were US imperilled native species with statutory protection under the ESA: federal lists of endangered and threatened wildlife (50 CFR 17.11) and endangered and threatened plants (50 CFR 17.12) as listed on the environmental conservation online system (ECOS) website (http://ecos.fws.gov/ecos/home.action) of the US Fish and wildlife service, downloaded in September 2011. The term “species” in the ESA list refers to any taxonomic level eligible for protection: including species, subspecies and distinct population segments (hereafter “species” for convenience). The database contained 1363 species (906 species on the continental US, 420 on islands and 37 marine species) (Online Resources 1). It is noted that the ESA list is continually updated; therefore, since the list of species was downloaded, 284 species have been added to take account of new species listed and of any species delisted for recovery, extinction or other causes. Non-native species in the US and its territories including Caribbean and Pacific islands (termed “foreign species” in the ESA list), and candidate species (proposed for potential inclusion in the ESA list) were not used in the search. The processing of references retrieved by our searches (Fig. 1) followed the PRISMA flow diagram from Moher et al. (2009), and was based on the following inclusion/exclusion criteria: (1) excluding references in which the studied species was not included in the ESA list; (2) including invasive species defined by the US Federal Executive Order 13112, 1999 as “an alien (or non-native) species whose introduction does or is likely to cause economic or environmental harm or harm to human health" (3) cultivated plants and livestock were not included as invasive species as deemed as being under control (NISC 2016), but feral animals were included; (4) all types of study were included, both experimental (e.g. exclosure or controlled and replicated manipulation) and observational (e.g. time-series data, geographical comparisons); (5) human pathogens were excluded; (6) the review was limited to English-language publications. It is unlikely that language bias was introduced as English is the official language of the country under study; (7) an impact was understood as any interaction in which a non-native species had caused a decline in the population abundance or geographical distribution of a threatened species. For each case study, the following variables were recorded: scientific name of the endangered or threatened species and non-native species; taxonomic group (plants, invertebrates, fish, amphibians, reptiles, birds and mammals); location of the study (continental US or island); habitat type (terrestrial, freshwater, brackish or marine); study type (observational or experimental); the direction of the interaction was recorded as either negative or neutral, based on the conclusions of the published studies; main mechanism of interaction (according to the classification developed by Blackburn et al. 2014: predation, competition, hybridization, disease, herbivory, habitat alteration, interaction with other non-native species). This systematic review did not attempt to quantify the strength of the impacts of invasive species on imperilled species; nor did the review compare the direction of the impacts. The main objective was to ascertain the number of imperilled species threatened by invasive species based on published scientific evidence. The Chi square tests were used to determine whether the proportion of impacted species varied among taxonomic groups and location. 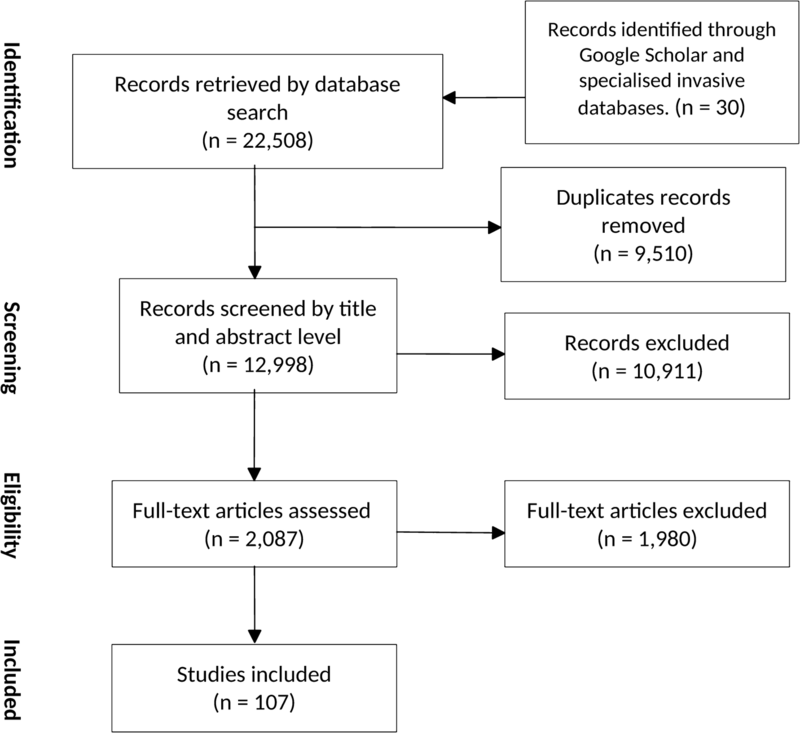 The search strategy found 12,998 unique references, from which 2087 were selected based on their titles and abstract using inclusion and exclusion criteria. From these records, 107 published papers (Online Resources 2) were included for the final assessment (Fig. 1). The disparity between the large number of references retrieved in the search and the relatively small number of final papers selected is the result of the high sensitivity of the search string used; this assured the capture of as much information as possible that might be relevant in order to avoid selection bias but, at the same time, as would be expected with this strategy, most references retrieved were unrelated to the topic of the review and so were unselected. The main sources of the final references were peer-reviewed journals (86.9%); the remainder were from grey literature (such as proceedings, doctoral theses and reports). The majority of studies were observational (76.6%) and the rest were experimental. Many of the references selected in the review were based on observational studies, which were frequently descriptive field studies and sometimes circumstantial correlation or speculation based on limited observation, and quite often based on assumptions, correlations or merely on the presence of invasive species, rather than on experimental and/or detailed field observations to determine their impacts. Thus, the information in the review literature should be interpreted with care. This review identified a total of 195 case studies of interactions between endangered or threatened species and invasive species (Online Resources 3) as some references contained more than one study. Of these, 175 case studies were unique. These included 116 endangered or threatened species (8.5% of the ESA list), of which 85 species (6.2% of the ESA list) were impacted negatively, and 31 species were reported with neutral interactions with invasive species. The proportion of endangered or threatened terrestrial species for which a negative impact was recorded was higher on islands (9.3%; 39, n = 420) than on the continental US (4.3%; 39, n = 906): (χ2 = 11.35, df = 1, p < 0.001) (Fig. 2). The proportion of endangered or threatened marine species for which negative impacts were found was 18.9% (7, n = 37), comprising four species of sea turtles impacted on the coast (terrestrial habitat) and three anadromous fish (Salmo salar, Oncorhynchus clarkii stomias and Oncorhynchus tshawytscha) impacted in a freshwater habitat on the continental US. The habitat for which the most studies were undertaken was terrestrial (54.4%), followed by freshwater (15.3%): 11 invasive fish species were included, and just one was introduced from outside the United Sates (Salmo trutta trutta); the remainder are the result of translocation of species between different regions on the continental US. Regarding geographical location, imperilled species impacted negatively were located mainly in the States of Hawaii (23.3%) and California (14.4%), which accounted for a large proportion of impacted species, along with the States of Arizona (5.0%) and Florida (5.0%), the Channel Islands of California (5.0%) and the island of Guam (6.6%). The impacts of invasive species on ESA species differed between islands and the continental US across taxa (χ2 = 28.9, df = 6, p < 0.001) (Fig. 3). Birds were impacted the most on islands, and plants and fish taxa on the continental US. The number of impacts assigned to each impact mechanism differed according to whether the interaction was occurring on an island or on the continental US (χ2 = 13.90, df = 6, p = 0.031); (Fig. 3). The main mechanisms were competition (26.4%) on the continental US and predation (23.6%) on islands, and the remaining mechanisms (herbivory, disease and habitat alteration) each represented less than 5%. For birds on islands, the main impact mechanism was predation by vertebrates, mainly by feral cats (Felis catus), rats (Rattus spp. ), and other species such as mongooses (Herpestes spp.) and the invasive snake (Boiga irregularis). On the continental US, plants were impacted mainly by competition with invasive plants; for fish, the main impact mechanism was predation by invasive fish species; for amphibians, the main mechanism was the chytrid fungus disease (Batrachochytrium dendrobatidis), mainly on the continental US. Although biological invasions are widely recognized as a key component of current global change (e.g. Mack et al. 2000; MEA 2005), there is much debate among scientists over whether invasive species are a major concern (see Richardson and Ricciardi 2013). A lack of scientific consensus as regards the assessment and management of invasive species has also been suggested (Young and Larson 2011; Humair et al. 2014; Estévez et al. 2015; Crowley et al. 2017).This uncertainty has been expressed in the popular media (Ricciardi and Ryan 2018). In addition, allegations of “invasive species denialism” have been made against those who appear to reject the scientific evidence, as opposed to expressing a scientific scepticism (Russell and Blackburn 2017). It could be argued that this controversy is partly rooted in the lack of a clear accepted framework for interpreting the impacts. 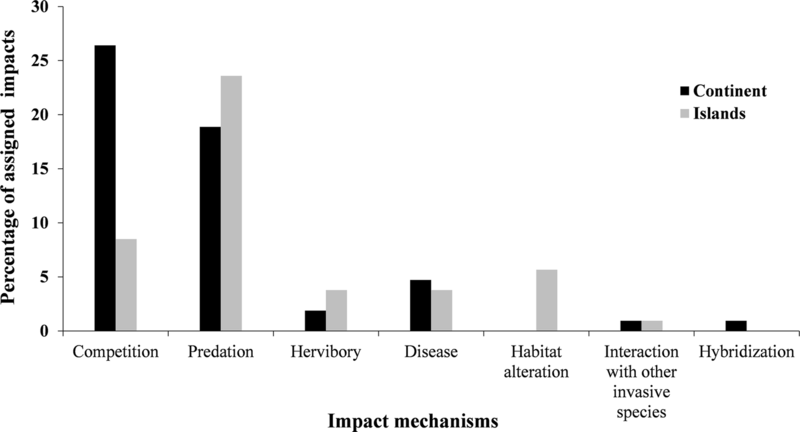 However, the main issue is that the impacts of most invasive species are not well known (Jeschke et al. 2014) and that for the vast majority, no quantitative information is available (Kulhanek et al. 2011; Larson et al. 2013; Simberloff et al. 2013). Research has been limited to a small number of species with some bias towards regions and habitats (Hulme et al. 2013), which has reduced progress towards a better predictive understanding of the impacts (Hulme et al. 2013; Jeschke et al. 2014). A significant effort has been devoted to invasion-related research, leading to a substantial increase in publications in the field (Pyšek et al. 2006; Richardson and Pyšek 2008) mainly in North America and Europe; more than half of these studies relate to North America (Pyšek et al. 2008) and in particular, the United States, which has one of the highest numbers of cited papers in invasion biology (Pyšek et al. 2006). Pyšek et al. (2008) argue that invasive species with the greatest impact are more likely to become the subject of a scientific study. However, the quantification of the impact of invasive species has not been well represented in the literature (Esler et al. 2010), and research has focused on a very limited group of invasive species (Hulme et al. 2013). For the majority of non-native species, the evidence to support their impact is lacking. The impacts of invasive species remain highly uncertain; for example, impact has been demonstrated for just 30% of non-native bird species (Evans et al. 2016) and documented evidence on the ecological impacts of invasive species was available for only 11% of these species in the DAISIE invasive species list in Europe (Vilà et al. 2010). Similarly, it is estimated that impact information is available for only 13% of animals imported into the United States (Jenkins et al. 2007). The uncertainties in the invasive species listing process are currently due to a lack of knowledge (McGeoch et al. 2012) and are a common problem in risk assessments (Bayliss et al. 2012). The ranking of threats undertaken by Wilcove et al. (1998), which stated that invasive species represent the second greatest threat to biodiversity, contrasts with recent rankings of threats to biodiversity, which accord invasive species a minor role. A WWF (2014) report stated that invasive species were a threat for just 5% of threatened species. Based on the information contained in the IUCN Red List, Gurevitch and Padilla (2004) determined that invasive species threaten only 6% of the species listed by IUCN, while Maxwell et al. 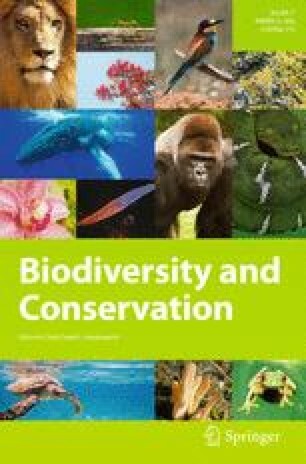 (2016) concluded that the main threat drivers are overharvesting, agricultural activities and habitat disturbances; invasive species threats played a lower-ranked role. The outcome of these studies is similar to the result obtained in our study, in which the quantification of impact of invasive species on imperilled species has been researched in only a few species (8.5% and with negative impact for 6.2% of species in the ESA’s list). These results contrast markedly with the 49% of imperilled species calculated by Wilcove et al. (1998). Therefore, the uncertainty related to the impact of invasive species remains high, and efforts to assess the impacts on invasive species should be increased. It could be argued that the low number of studies found in this review reflects the fact that many impacts are difficult to detect (Parker et al. 1999), can only be assessed after long-term studies (Gilbert and Levine 2013; Simberloff et al. 2013; D’Antonio and Flory 2017), and are particularly difficult to identify at ecosystem level (Simberloff 2011). The detection of the impact of invasive species is affected by the lag phenomenon, also known as an “invasion debt” (Essl et al. 2011)—the existence of time-lags between the introduction of an invasive species and its impacts (Kowarik 1995; Crooks and Soulé 1999). The effects of invasive species are also affected by the scale of the study (Powell et al. 2011) and by the approach used to measure impact; these factors could influence the direction of the impact (Thomaz et al. 2012) and could lead to misinterpretation of the effects of invasive species. It has been noted that when the results of the direction of the impacts of invasive species are positive or neutral (non-significant or null), it is likely to be unreported (Schlaepfer et al. 2011). This is known as publication bias, and relates to studies which find a significant positive result and are less likely to be submitted for publication; it is inherent in literature reviews (Dickersin 2005). However, we did find references that reported neutral results (15.8% of all references selected), which suggests that at least some non-significant results were published. The strength or the signs of interactions between species can change as a function of biotic or abiotic conditions. This variation is common in nature and is often described as context dependency. Various studies have highlighted this as a potential limitation in ascertaining the impact of invasive species (Ricciardi et al. 2013; Kumschick et al. 2015). For example, variability is quite notorious in invasive plant species at community level, albeit in other cases the impact is less context-dependent (Pyšek et al. 2012). It should be noted that the results of this review would be different if other US lists of threatened species were to be used instead of the ESA List, which is a subset of all US imperilled species; it contains at least ten times’ fewer species than the NatureServe list (www.natureserve.org/explorer/) (Wilcove and Master 2005), which is also the case with IUCN-listed species in the USA (Harris et al. 2012). Additionally, imperilled species identified in our review may be impacted by more than one threat other than an invasive species, as most of the ESA-listed species are affected by more than two threats (Schemske et al. 1994; Czech and Krausman 1997; Wilcove et al. 1998), and sometimes more than four (Lawler et al. 2002), which makes it difficult to distinguish invasive species impacts from those caused by other synergistic stressors (MacDougall and Turkington 2005; Didham et al. 2007).The synergistic effects of the invasive species threat with other threats, such as climate change or habitat alteration, can exacerbate the spread and the negative effects of invasive species (Dukes and Mooney 1999; Simberloff 2000). This review showed that the main mechanism of impact was predation by vertebrates, threatening mainly birds on islands. This is consistent with recent studies that have examined the threats to terrestrial vertebrates posed by invasive species globally, where rats (Towns et al. 2006) and cats (Medina et al. 2011) are a major threat to terrestrial vertebrates, especially bird taxa (Blackburn et al. 2004); threats tend to be greater on islands than in continental areas (Bellard et al. 2016b). The other main mechanism that impacted a high number of species is competition between invasive and imperilled plants, particularly in the continental US. There is not much documented evidence so far that competition from an invasive plant species can cause the extinction of a native plant species (Reed et al. 2002; Davis 2003; Sax and Gaines 2008), and the extinction of plants is driven mainly by habitat alteration (Bellard et al. 2016a). However, invasive mammal predators have been identified as being involved in the majority of extinctions of endemic native vertebrates worldwide, mainly on islands (Bellard et al. 2016a). Another cause of important recent extinction events by invasive species is the chytrid fungus disease, affecting only amphibians (Bellard et al. 2016a). This review found that this disease affected some amphibian species, mainly on the continental US, where this taxon should be considered to be at high risk of extinction. As regards spatial distribution, the imperilled species impacted negatively by invasive species were located mainly in the States of Hawaii, California, Florida and Arizona. These areas correspond with identified biodiversity hotspots (Dobson et al. 1997; Richter et al. 1997; Flather et al. 1998). They also host higher numbers of invasive species as a result of economic activity (Czech et al. 2000). Nevertheless, the highest percentage of imperilled species (9.3%) impacted by invasive species occurs on islands. This is consistent with other studies that suggest invasive species have their greatest impact on islands (Courchamp et al. 2003; Clavero et al. 2009). Uncertainty resulting from the lack of empirical evidence regarding the threat posed by invasive species remains high. Efforts to reduce the risk of extinction should be based on scientific evidence and standardized methods, specifically prioritizing the species included in the ESA list. In order to reduce uncertainty, one option might be to increase funding for research to quantify the impact of invasive species (Pyšek et al. 2008); such species-specific information is essential to identify effective conservation actions and to improve the preparation and implementation of the recovery plan for imperilled species (Boersma et al. 2001; Clark et al. 2002). It is recommended that invasion biology should focus on better defining and quantifying the ecological impacts of invasive species (Byers et al. 2002; Gurevitch and Padilla 2004; Simberloff et al. 2005; Larson 2007) in relation to other drivers of global change. We thank Richard Shaw, Pablo Gonzalez-Moreno, Carol Ellison, Oliver Pescott and an anonymous reviewers for comments and suggestions on this manuscript. This study was funded by the United States Department of Agriculture under the Invasives Causing Extinction (ICE) Program.